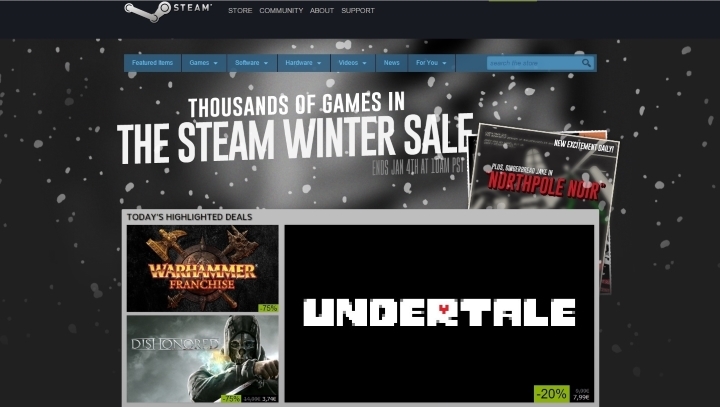 Steam, the online digital distribution service that sells PC games, is now past its 10th birthday and a massive success by all accounts. American company Valve sells millions of games online each year on the platform, and its shaky debut together with the launch of the Half-Life 2 video game in 2004 is now a distant memory. And proof of Steam’s success is the new top selling video game list published by Steam Spy, a service that publishes Steam stats and is run by Russian citizen Sergey Galyonkin. 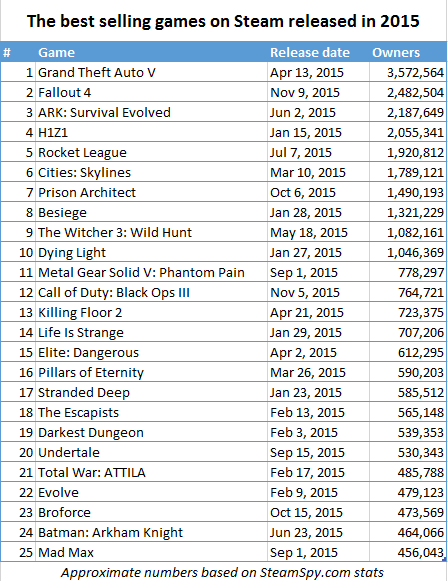 This list shows the top 25 best-selling video games of 2015 on Steam, but as Galyonkin’s website warns this is a partial list based on data collected until the 20th of December, and taking into account that the Steam Winter sale is going on right now, it is likely that the final list will be slightly different. 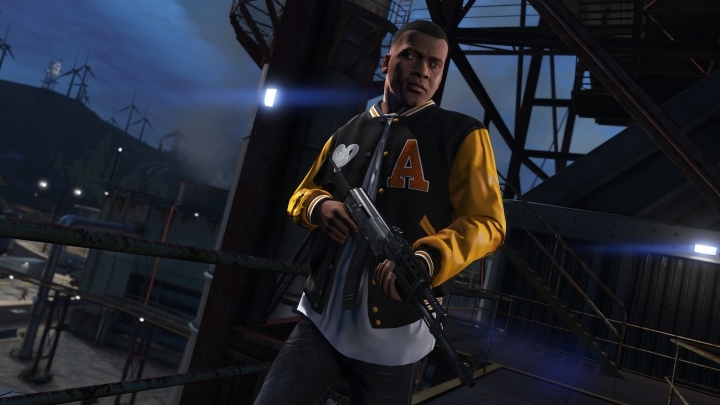 Rockstar’s GTA V continues to break sales records. But nonetheless, it is still fascinating to see which games were the top PC sellers this year, as the PC is the platform with the largest user base, and Steam alone has over 125 million users. And looking at the list, it is not surprising to see Rockstar’s GTA V lead the pack. After all, the game was already one of the top selling games on consoles, and even if the PC version arrived a little late, it was still a rock-solid port and definitely the best-looking of the lot. Although some may be dumbfounded by GTA V’s performance on PC given that the game was originally released in late 2013 for consoles (and has been the subject of much controversy), but the success of its multiplayer component GTA online, which has been expanded recently, means there is no stopping Rockstar’s juggernaut. And it is also great to see The Witcher 3: Wild Hunt at number 9, having sold over a million copies on Steam, as Geralt of Rivia’s latest adventure is a fantastic open-world RPG and our overall top PC game of 2015. But other games like Warner Bros.’ Batman: Arkham Knight also made this top selling list. And while Batman: Arkham Knight was one of the year’s top games on consoles, it is surprising to see the PC version being a top seller as it had one of the worst launches to date. Although probably Steam Spy’s list is not taking into account Steam’s new refund policy, as it is likely that a significant percentage of disgruntled users requested refunds of Warner Bros.’ Batman game. Another thing that is worthy note is that there are not that many PC exclusives or games not available on consoles making the list, with exclusive games like Cities: Skylines, one of the year’s top PC games, coming in at number 6. Other vintage PC series like Total War made the list, with Total War: Attila selling almost half a million copies, but clearly it is multiplatform games that dominate this best-selling list, as it happens in the console world. And games that were or are on Steam Early Access, such as ARK: Survival Evolved, have also been top sellers this year. The Early Access program allows Steam users to play video games that have not been released yet, providing feedback and helping deal with video game bugs, in effect taking part in the game’s development. But Early Access has been criticized because it makes PC gamers pay to do a developer’s work (although they get to sample the game early), even paying for games like the zombie online title H1Z1 (number 4 on the list), which will be free to play when its eventually released. In the end though, this list certainly proves that PC gamers have been as busy as their console counterparts this year, and also that the PC is a worthy gaming platform and one that will hopefully see as many great releases next year as there were in 2015. Next: Rise of the Tomb Raider Sales Not Great, Will the Game Come out Early on PS4?